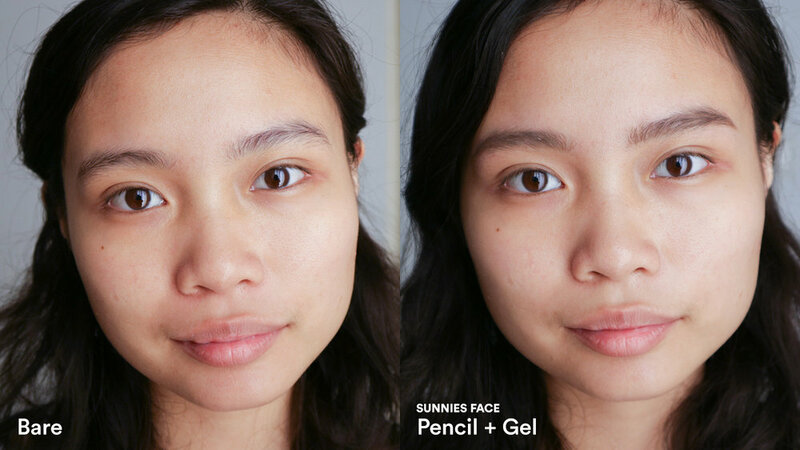 Recently, Sunnies Face released their third product: the Lifebrow duo consisting of a retractable skinny pencil and a grooming gel. The promotional photos were truly gorgeous, but what hooked me was the smallness of the grooming gel’s brush, which is not something we see in the market that often. I thought the price was right, and there was no store queue at the UP Town Center branch, so I went to buy them as soon as they launched. Lifebrow comes in two shades: Warm Brown (for warm-toned people) and Ash Brown (for cool-toned people). Warm Brown isn’t your usual red pencil and isn’t terribly warm, but I think the brand could release a separate black/black-brown shade for those with black hair. I would’ve also wanted to mix and match pencils, but the set, which I purchased for P595, are paired accordingly. I’m actually tempted to get the Ash Brown to get my perfect mix! I had my brows microbladed in August 2018 and it’s starting to show gaps, with the front part of the brow having hair strokes tattooed. You can see those starting to fade as well. 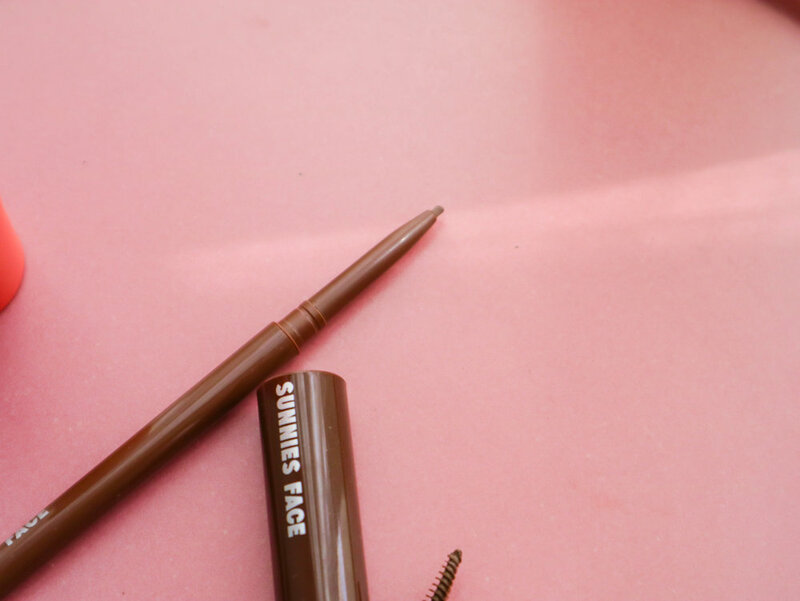 The Skinny Pencil is meant for drawing hair-like strokes, similar to that of Anastasia Beverly Hills’, Benefit’s, and many more. 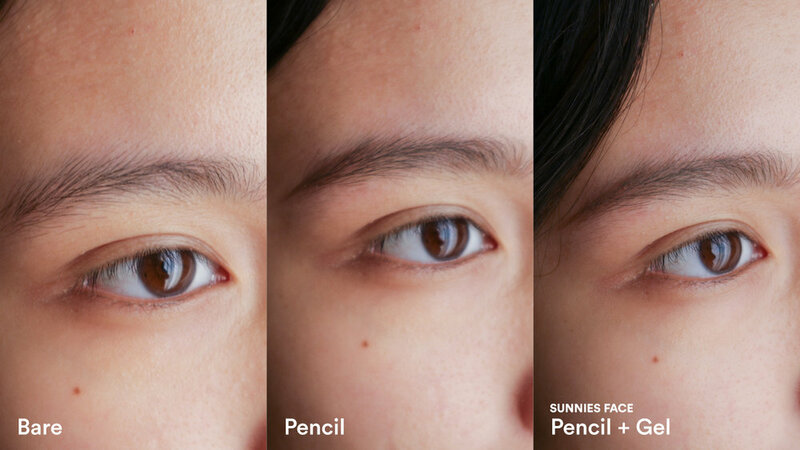 I find that it does just that, and that the pencil isn’t too hard or soft, nor too pigmented. It’s not easy to overdo it. I actually wish it was more buildable, or to be available in a darker shade for nights out, but this is pretty great as is. I also did my sister’s brows using the products so you can see what it looks like on barer brows. I like how skinny the line is and how it perfectly fills in the gaps of my microbladed brows. Brushing the spoolie through helps to make it even more hair-like. My sister thinks that they look better than her usual powder. The Grooming Gel is kinda perfect. I’ve tried many other brands before, from drugstore to high end, and I’ve always had the same problem: too much pigment deposit. 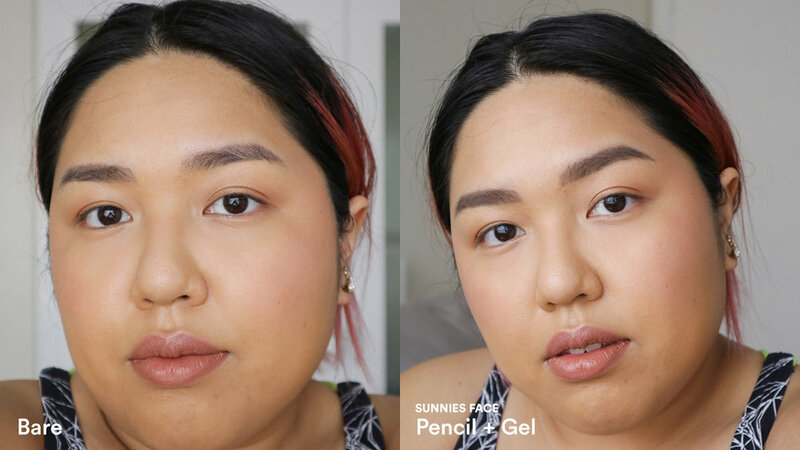 Sunnies Face’s gel has a “tree” wand that deposits the exact amount of pigment to fill and shape the brow. My microblading technician wanted to extend my tail, and, as a result, trimmed my natural hair. Now I need to trim it or find a gel that keeps the hair tail in line with the tattoo tail. You can see where my hair actually ends and how the gel keeps it in place in the photos above. The only other product I’ve seen that comes close to that tiny brush size is the Etude House Eyebrow Contouring Multi Pencil (roughly the same price as the set and not always available) that has an even smaller tree brush but tends to deposit blobs of pigment. With Lifebrow, I don’t need to take a spoolie to fix any blobs, unlike with NARS, MAC, Glossier, Nichido, Jazzy, Essence, etc. The Grooming Gel also makes the hair stay in place, more so than the aforementioned brands. You can build the pigment (see mine), or keep it natural (see my sister’s) as well. Bonus: it stays on even after a workout! Overall, I think people will love the Grooming Gel, while novices might shy away from the Skinny Pencil. If you’re looking for something inexpensive that works, get the set. The Skinny Pencil is a touch more expensive than other drugstore options though, but I don’t mind since the fine tip is rare at this price point. Here's a fun fact: I was the literal first person to purchase the Fluffmatte lipsticks in the first ever Sunnies branch, and I refused to be photographed because I felt a sense of guilt. I felt the same thing when I bought the highlighter and brow set. Writing this now still confuses me because I can’t deny that I’m attracted to the brand. While the country remains divided on whether the Marcos dictatorship was good or bad, I know where I stand - in the critical opposition. But buying into the Sunnies brand has activated many cognitive dissonances within me. How can I “give money” to people who support those who have caused so much pain to others? Also, why do I feel guilty for this purchase but not for my purchases from NARS, L’Oreal, Estee Lauder, MAC (who have faced backlash when they entered the Chinese market and lost their cruelty-free statuses), and many more? Coco Chanel was a literal Nazi agent, Jeffree Star has a history of racism, Kat Von D is an anti-vaxxer, Marc Jacobs admits to cultural appropriation, H&M is one of the largest fast fashion brands and contribute to the destruction of the planet. Many, many local bigwigs and celebrities (who have collaborated with your favorite makeup brands) are part of the oligarchy that enable the status quo to flourish. Even Rihanna, who is at the forefront of inclusive beauty, has a racist past. Am I then complicit in making the inexplicably rich richer? The abusers more powerful? When we think of all our purchases, we evaluate them based on quality and price but neglect their origin and cost. And the brands I mentioned aren’t the only ones that are problematic. Everywhere we turn to, even and especially outside the realm of beauty and personal care, the same questions arise. Some undeniable facts (regardless of industry but still very much applicable to makeup): many founders are intertwined with unethical behavior, beauty standards can harm self-esteem or be downright racist, overconsumption leads to an increase in waste and environmental degradation, cheap labor is outsourced to countries that enable workers’ abuse, animals are harmed in the process of production, and the income gap continues to widen. To this moment I am caught in between guilt, restlessness, and confusion. I think about my shampoos, soaps, cotton buds, grocery and department store purchases, and wonder how to align my current self with my ideal. Which is why I’d like for us to discuss the issue further in the comments. Do you think we should evaluate products with respect to their production and ownership? How do you make purchasing decisions when you consider the ethical implications? How do you choose which to avoid and which to support? High five, BROw: Men take on the peel-off brow tint trend - do they like it?